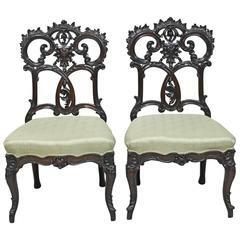 A lovely pair of American Victorian chairs in hand-woven wicker with peacock back and bird-cage legs, possibly Heywood Wakefield, circa 1880. Measures: 19 1/2" wide x 24" deep x 38 1/2" high (seat height: 16 1/2" without cushion). 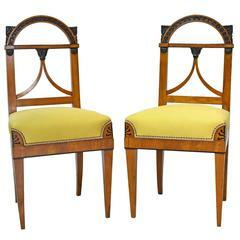 Chairs are of an exceptional design &amp; in amazingly good condition considering their age. There are a few minor missing pieces &amp; some minor repairs that have been photographed. Chair seats were replaced at some point by machine-woven cane. Great for indoor or outdoor entertaining. Easy collapsing feature lets you store them away. (Please confirm item location - NY or NJ - with dealer). 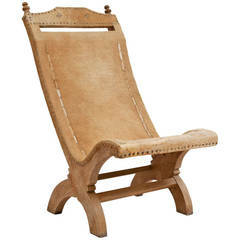 Tub chair model E2608 in Italian wicker by Tempestini for Salterini, circa 1952. Many other Salterini and Woodard pieces also available-- please inquire for details.